Work officially started on Schilperoortpark at the Leiden Bio Science Park on Wednesday 6 March. 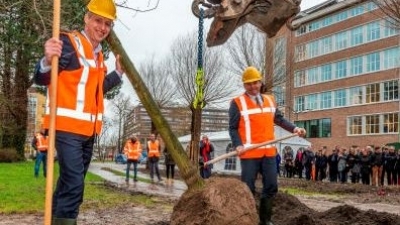 Town councillor Paul Dirkse and Vice-Chancellor of the Executive Board of the University Martijn Ridderbos planted the first tree together with Cas Schilperoort, grandson of Professor Rob Schilperoort, the founder of the Bio Science Park after whom the park is named. The new public park will be in the north-eastern part of the Bio Science Park, between Wassenaarseweg and Poelwetering, in the area by the former pathology building. The greenery will extend into the adjoining residential area, where the former medical laboratories have been transformed into housing. This will give the whole area a park ambiance, with cycle and pedestrian paths running through it. The University is developing the area in close collaboration with the Municipality of Leiden. The park was designed by EDM Tuin en Landschap, and ties in with the Hollandse Campus masterplan for the whole area that was developed by Studio Hartzema. The park will have three different sections: a wooded area on the Wassenaarseweg side, a grass field for sport and games, and a large pond close to the pathology building, where LAB071 restaurant will soon open its doors. Development of the park will begin once the roads around the residential area have been redeveloped. Schilperoortpark will be completed mid-December. More information on the website Schilperoortpark.